About Us - Casa Grande RV Resort & Cottages - AZ No announcement available or all announcement expired. The guest is always right. If you think the guest is wrong, read Rule One again. Our entire staff is focused on R.A.P.I.D service to all our RVers. Guiding our daily actions are Respect, Accountability, Perseverance, Integrity, and Discipline. We are totally committed to these core values. From the moment you call us or walk in our door, we want to make sure you are in the right place and that everything is running smoothly. We take the extra steps necessary to make things right for you. 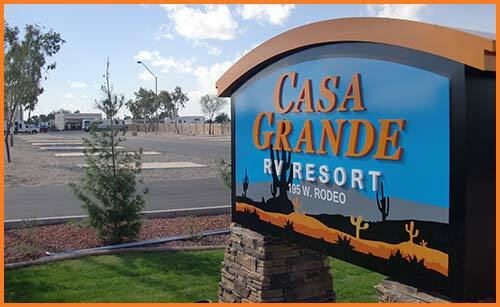 At Casa Grande RV Resort, our staff will make sure to ensure everything is in perfect order. Whether you need help with your Wi-fi connection or advice on wonderful local day trips and RV resort activities, our staff is committed to providing great service and warm Arizona hospitality. You will leave as our friend and honored guest with hopes you will return soon.